RICHARD BASSETT arrived in Trieste in 1979. He was 22 years old, fresh from a degree at Cambridge, and tasked with filing foreign dispatches for the Times in London. His hosts welcomed Britons, grateful for their role in the war and admiring of the nation’s apparent stability; “English? How nice!” was a phrase Mr Bassett heard often. As this particular Englishman was genial—in possession of what you might call a clubbable personality—cultured and Catholic, he was well equipped to navigate the ex-Habsburg countries. With these vivid, wistful memoirs, he joins the great chroniclers of Europe—the Prousts, Zweigs, Lampedusas, Leigh-Fermors and Bassanis—and shows how some of the things those writers loved persisted as late as 1989. Mr Bassett found dying douceur de vivre in Trieste’s streets, where shuttered shipping offices hinted at the city’s history as an ancient port on a classical coast. Illyrians, Greeks and Romans were a prelude to almost 600 years of Habsburg rule. 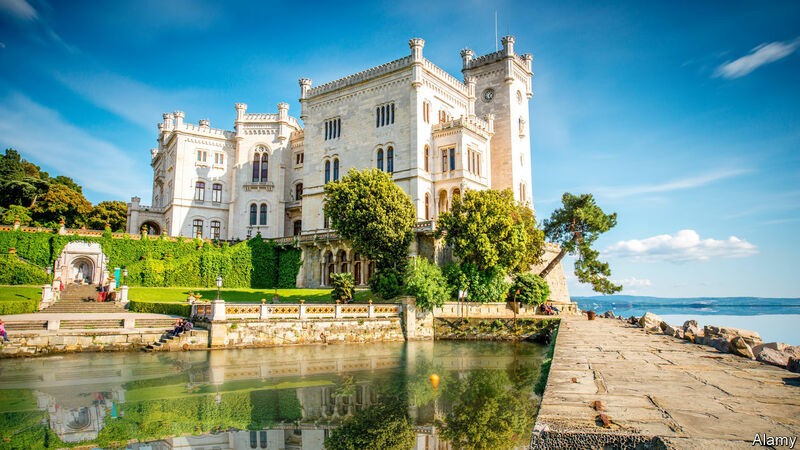 Emperor Maximilian of Mexico built the “cursed” Castle Miramare (pictured) there, complete with a throne room, and ordered its garden pavilions to be filled with nightingales days before he faced the firing squad. He finds that Vienna had lost its purpose by the 1980s, the great capital of the Holy Roman Empire relegated to provincial listening post. As the Iron Curtain twitched nervously, the once-regal Demel café became a front for the Stasi. The city was alternately seedy, in line with its depiction in Graham Greene’s “The Third Man”, or imperial and majestic, as evident in the Schönbrunn Palace. But it could be touching, too. Mr Bassett’s remark that he felt “almost a chemistry” with Gustav Klimt’s “Portrait of Sonja Knips” prompted his amused interlocutor to unlock a cabinet and hand him the notebook the sitter is holding. As 1989 approached, Mr Bassett’s schedule became more hectic (though he still found time to drink too much with the Queen’s Dragoon Guards in Germany and to become principal horn at the Ljubljana Slovene National Theatre). He saw Helmut Kohl crying when jeered at the Berlin Wall as it fell, DDR troops goose-stepping and the last king of Montenegro being reburied at Cetinje. He visited the tombs of Goethe and Schiller the day Germany was reunited. He heard Smetana’s surging “Má Vlast” played to exuberant Velvet Revolutionaries in Czechoslovakia, and, surreally, was sheltered from a police crackdown along with Shirley Temple. This book’s wide scope—Mr Bassett ranges across Europe—and the author’s elite upbringing will be disliked by some readers, and those who view the past as not just a foreign country but also a retrospectively offensive one. But as well as romantic descriptions there is keen understanding, and a subtle critique of the “turbo-capitalism” that took hold after 1989. Revisiting Duino in the 1990s, Mr Bassett found Rilke’s interiors uninhabited, its contents dispersed at auction, and it seemed that an entire civilisation was for sale.